You can download a limited demo version here, it says Pro Car but the demo version is for all vehicles. Upon order you will get an automatic link to the full version and a username and password to unlock it. If you are a registered user do not use the demo version since you can only save a fraction of the data when using it! Contact me instead if you need to get the latest version. Don't do this if you are a registered user unless you first backup your own data! The demo version is limited since you cannot save more than session notes and tracks. You can however do everything else which is the intention. 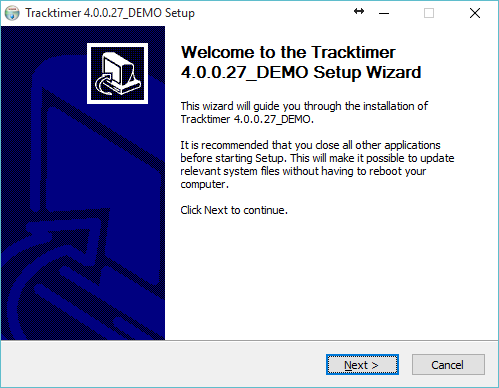 If you buy a race bike/car/kart from a Tracktimer user you can take the sellers backup and look at it using the demo version. As an example download this file, save it to the hard disk, start Tracktimer and choose Restore from Tools-Backup/Restore to restore my personal data from 2004-2005. Note that the sessions and the tire list are only visible if the chosen vehicle is motorcycle. I will try to upload similar files for cars and karts too. A Track Pack is nothing but a collection of tracks stored in a zip-file. Download and extract the contents of the file and follow the instruction in the file readme.txt to import the tracks to your system. I found a great place for track information, check out the www.etracksonline.co.uk site by Neil Tipton. Here are a number of different scenarios starting at the very first time Tracktimer is started. Either run the demo directly or select the zipped version to download it to your computer. If you download the zipped versions also place this file in the same directory and navigate through the demos using that file. Make sure that the actual track exists on the Tracks page. If not press the "Add Track" button to add it and enter a track length. Go to the Setup page and enter as much information as you need. Go to the Actual Session page, press the button New Session and select the track you just created. 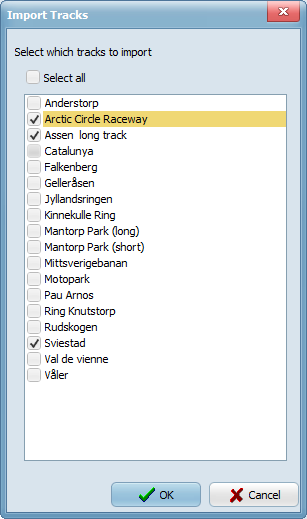 To time a driver using Tracktimer first enter the name of the Main Driver on the Actual Session page. Press "Start Session" to prepare timing. As the driver passes the start/finish line press "Stopwatch" button (or F5) to start the timing. Of course you can also enter lap times manually, just right-click on the timing grid and select "Enter lap times manually". Save the session when done to review it later (not possible to save setup data in the trial version) or export it to html by selecting "Export HTML - Session(s)" to get a quick overview.